We have had Kahmed79 bought us reviews of very nice cars in the past until he went MIA (missing in action) and than BilalTQ followed in the footsteps of KAhmed bringing us few reviews of few cars in a very good style followed by Vcheng who recently test drove a Fisker Karma and his in-depth analysis and so many pictures made the review a very good one to read. You can find there test drive threads here. But all the above members are seniors, in terms on time spent on PW as well as in age and experience but when your seniors set a such good standard and practices than the youngsters also follow in a way that leaves us spellbound. It’s been a while since I have been last on Pakwheels, busy life all around here but anyways, few days back my best buddy bought two new Ferrari FFs and I drove them personally and I simply loved them. Regarding the looks of this car, it could have been better and the one I drove should have been in RED, aren’t I right? But a matter of fact, you forget all these things once you’re inside a supercar like the Ferrari FF which produces 651bhp which is almost equivalent to that of Ferrari Enzo which produces 660bhp and is as quick as Lexus LFA as the FF goes from 0-62mph in 3.7 seconds. It is great around the corners, quite gripe and really manageable. While I was driving, the T/C (Traction control) was switched ON for safety because I didn’t want this thing to be driven wildly. I took this car till around 180kph, I felt too many forces back than. My personal experience would also include the typical engine noise of the Ferrari at the start-up when you press the ignition button, V12 just roars not only at high revs but also when you’re driving around in the city at low revs which is quite impressive. Moving onto the 7-speed dual clutch transmission, it is quick when you change gears through paddles but then again I felt 6-speed manual would have been better in this sort of car. 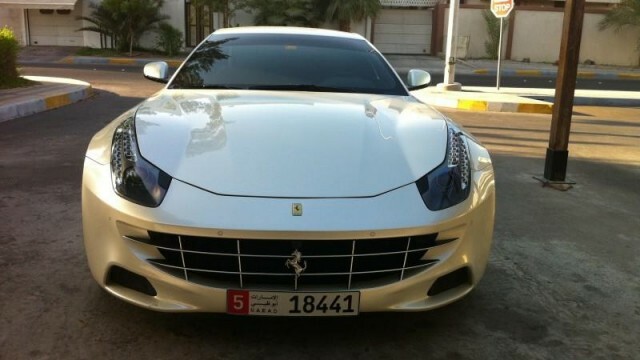 The ride of Ferrari FF is comfortable unlike any other Ferrari I would say. It has quite some leg room for the back passengers. Two LCD screens at the back plus the navigation system in the front. The front Camera in FF and the LED lights on the steering are optional. And yes, I wish it was offered with sunroof which adds weight to the car but I think it is useful.